There is something about baking that is very soothing. Maybe it’s the mixing of the ingredients with exact precision or maybe it’s the aroma of cinnamon and vanilla in the air. Either way, I find baking to be quite theraputic. So I made these Cinnamon Blondies with the intention of baking cookies. But once I mixed everything through, the batter was way too runny for cookies. I just put the whole batter into a square cake tin and this is the end result. As usual, this is completely grain-free, gluten-free, and low-carb. I really like this recipe as it doesn’t contain any eggs. A lot of baking with coconut flour or even almond flour often turns out with a strong egg-y taste which a lot of people don’t like. This just tastes like a lot of cinnamon with a hint of almonds. Combine the dry ingredients- coconut flour, baking powder, cinnamon and salt in a bowl. In a separate bowl combine the wet ingredients- honey, almond butter, coconut milk and water. Mix the dry into the wet ingredients. 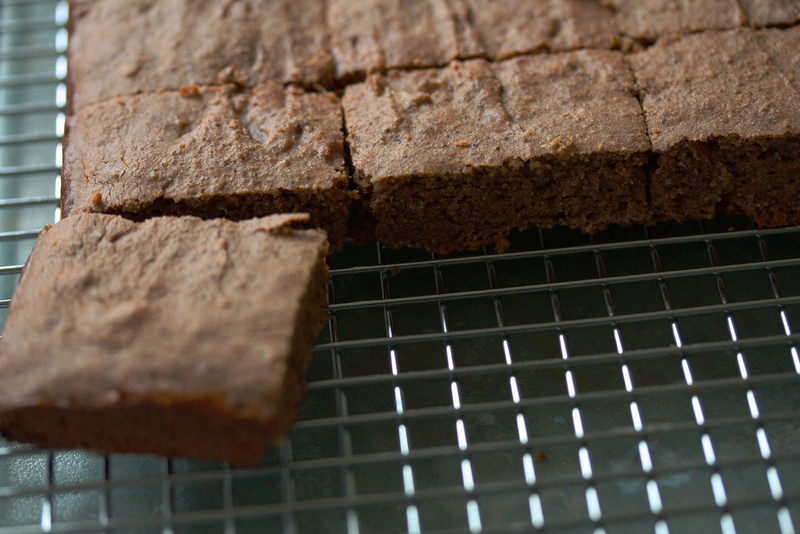 Grease a square cake tin with butter or coconut oil. Pour batter into the greased cake tin and spread evenly.